Well-oiled men with glistening muscles, an audience ranging from eight to 80 in rapt attention, an engrossed man with a camera slung around his neck and a judge peeping from behind a foggy window. These and other images tell you the unusual but interesting narrative of a little-known event in Mumbai: the Annual Zoroastrian Bodybuilding Championship, which faithfully yet quietly provides a platform for the young men of the community to display their might. "There was a lot of action there," says photographer Aparna Jayakumar, 26, who has captured some striking on-stage heroics and candid backstage moments with her camera. It is hard to match the men with rippling muscles and unbridled energy to a community that is probably best known for its dwindling numbers and piquant mannerisms. 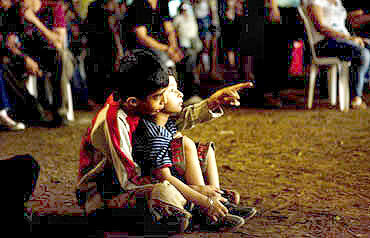 "We normally think of the Parsi community in terms of dwindling numbers. But body-building is such a symbol of male virility, strength, it seemed very ironic," says Jayakumar. She talks about how, when she visited the participants backstage, she was surprised by their level of enthusiasm at being photographed. "Many of them wanted me to take their picture. They even shared their email ids so that I could send them the photographs," says an amused Jayakumar. As for the audience and judges of the normally reclusive community, they were far from being offended or even disturbed at being photographed. "They didn't even notice me. They were far too absorbed in the show," says Jayakumar. 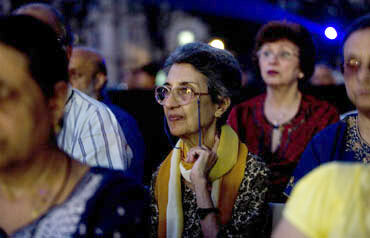 Pointing to the photograph of a woman with thick-rimmed glasses who sits apparently transfixed among the audience, she muses, "Look at this lady, for example. I thought to myself -- What is she doing here? What has she come to such a show for? What does it mean to someone like her?" Jayakumar points to another photograph, where an elderly woman is being escorted down the stairs by a young man at the venue. "She was not really interested in what was going on. She was playing cards all the time. But when she was coming down the stairs, these participants made way for her," she explained. 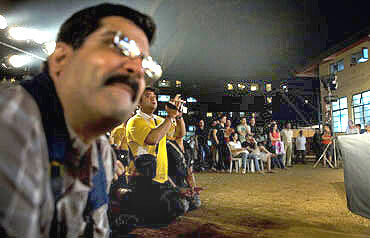 The piece de resistance; the photograph that stands out, is a young man watching an elderly man with grey hair hanging upside down from a bar. "That is Adi Patel. He is 72 years old, and he is the opening act for the championship," informs Jayakumar. "I wanted the photographs to have a sense of humour, for each one of them to tell a story, weave a narrative through them," she adds. Jayakumar was surprised at the amount of interest her exhibition has generated about the championship. Very few people outside (and even within) the community knew about the annual event, which is currently in its ninth year. "One of my friends had read about it in a Parsi newspaper. I thought it might be interesting, so I decided to drop in with my camera," she says. This is not Jayakumar's first brush with the Zoroastrian community. The copywriter-turned-photographer also did the publicity stills for Sooni Taraporevala's directorial venture Little Zizou -- a fond look at the highly talented and tiny community. Jayakumar then went on to work on Vishal Bharadwaj's Kaminey. "There are so many people doing so much good work out there. People who do good work should get recognised," she says. 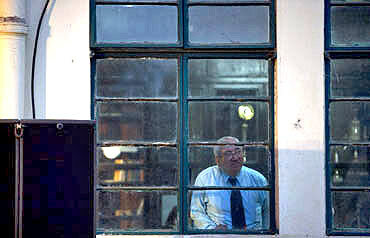 But the photographer rues, "Such people just have no avenues or outlets to showcase their work. There should be a space for other kinds of work. But Bollywood dwarfs everything here.". She points out, "If a top Bollywood actor was one of the participants in this event, thousands of people would turn up and watch it. Otherwise, not too many people care." On why she decided to hold the exhibition at a cafe rather than the more conventional gallery, Jayakumar says, "These are light-hearted, fun photos. I wanted to put them up in a space where different kinds of people hang out, where they can look at the photographs and form their own opinions or interpretations." 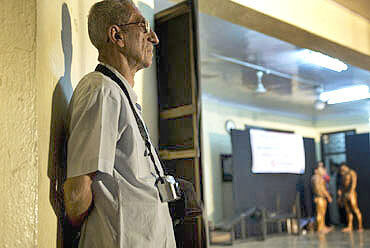 Farhad Bomanjee, the owner of the cafe, is a Parsi and a photographer to boot, she points out. Jayakumar's next project promises to be an equally interesting one. She is documenting the last days of the Premier Padmini taxis, the yellow and black vehicles which will be phased off Mumbai's streets soon. It is another subject that the young photographer feels strongly about. "They have been asked to give up their Fiat taxis. They have been given almost no time or money to do that. There is bound to be a sense of frustration in them," Jayakumar says, defending the much-maligned taxi drivers of the metropolis. "It is a project very close to my heart. I want to document the colourful nature of these cabs, the lights, the poles (inside some cabs). It is a way of saying goodbye to these Padminis, which for me are a symbol of the city," she says. She admits that it is neither glamorous nor easy being a freelance photographer. "It is hard to be taken seriously sometimes. Some people don't understand what I do. They ask, 'so what do you do, you just take pictures the whole day'," says a bemused Jayakumar. "There is little tolerance for anything that deviates from the norm," she points out, and adds wistfully, "I wish that would change."